Rei Kawakubo, the Japanese creator of the label Comme des Garçons, is regarded as one of the most influential designers in modern fashion. Known for her voluminous, monochromatic, and architectural silhouettes, Kawakubo makes designs that appear to be more concerned with novelty and sparking interest and dialogue than with straightforward attraction or luxury. Ever since her breakthrough into global fashion in the Eighties, her following has been ardent and loyal. Even so, the Metropolitan Museum of Art’s major retrospective of her work, “Rei Kawakubo/Comme des Garçons: Art of the In-Between,” is striking: the first retrospective of a living designer since its showcase of Yves Saint Laurent thirty years ago. It is a particularly challenging task. The seventy-four-year-old’s designs defy definition, and Kawakubo has never offered an easy way in. She gives no explanation for her works—which vary from large, sculptural dresses to intricate and often elaborate multi-textured pieces—and avoids traditional categorizations. In keeping with this approach, curator Andrew Bolton, in collaboration with Kawakubo, has selected nearly 150 pieces from throughout her career. These are displayed in a stark white labyrinth of alcoves. There is no extended wall text or labels, but an accompanying paper booklet offers more information about each piece. Rather than a chronological ordering, the clothes are arranged according to nine dichotomies, such as “High/Low,” “Clothes/Not Clothes,” or “Self/Other,” with further oppositions within each category; “Self/Other,” for example, includes the sub-headings “East/West,” “Male/Female,” and “Child/Adult.” In the last, two looks from her seminal spring/summer 2014 collection titled “Not Making Clothes” convey the tension between uniforms deemed appropriate for these different periods of life: a ruffled dress of pink polyester encased within a white, cage-like bustier looks both juvenile and fetishistic, while another dress, printed with a floral pattern and with a stuffed teddy bear appliquéd to its skirt, seems to bring the “cute” aesthetic at which Japanese culture so excels to its absurd conclusion. “Art of the In-Between” is organized to emphasize the space between these artificial boundaries, where Kawakubo feels her designs most comfortably live. The exhibition offers a survey of her trademarks: frayed edges, asymmetry, achromatic outfits—particularly in blacks and reds—and fabrics punctuated by holes (“Comme des Garçons lace,” according to Kawakubo) are found throughout. The mannequins’ ornate headpieces and wigs, which are not available for sale, are the masterful work of Julien d’Y’s, a longtime Kawakubo collaborator. Peek into one tunnel labeled “Design/Not Design” and you’ll find a bulbous dress, seemingly made of brown-paper-bag material, its shape calling to mind Niki de Saint Phalle’s balloon-like Nana sculptures. Around another corner, in “Model/Multiple,” is a coven of headless mannequins with poitrines painted in silver grey. Each mannequin wears a structured and variously shaped white cotton skirt with different stripes of black interfacing. These are examples of the thirty-four designs that composed Kawakubo’s “Abstract Excellence” collection from spring/summer 2004; seen together, each skirt in the flock seems both like an original work and a reproduction. Kawakubo chose not to use her own name when she created her label in 1969 in Tokyo. “Comme des Garçons,” or “like some boys,” allegedly lifts a line from a hit Françoise Hardy song that talks about the sadness of being alone, surrounded by couples—which may seem ironic or fitting, depending on your perspective, considering her iconoclasm and individuality. (Kawakubo has denied that the words have meaning beyond her appreciation of how they sound.) Kawakubo’s first show in Paris was in 1981, when she was nearly forty and already well established in Japan. Her early designs took inspiration from Japanese folklore. Though the fashion establishment didn’t embrace the renegade Comme des Garçons at first, perhaps because of the label’s confounding departure from classic ideals of beauty, Kawakubo’s designs were immediately popular among edgier fashion followers. Physical distortion, a theme throughout Kawakubo’s work, proves disturbing to some, while alluring to others. In the 1990s she began collaborating with artists in other fields. She worked with Cindy Sherman on promotional photographs in 1994, and created the coveted, biannual image-based magazine Six (named after the sixth sense) between 1989 and 1991. Unsurprisingly, the late feminist writer Kathy Acker, known for her experimental work and punk persona, wore Comme des Garçons out and about early on. Kawakubo made the costumes for Merce Cunningham’s Scenario using her spring/summer 1997 collection “Body Meets Dress—Dress Meets Body,” which largely consisted of padded garments (derided by the press at the time as “lumps and bumps”). But her last seven collections have become more sculptural still; her 2014 “Not Making Clothes” collection included a black crop-top with suspenders attached to a padded column skirt. In another piece from the collection, a black version of the aforementioned cage-bustier is filled in with sheer paneling and polyester ruffles. Over the years a kind of cult of personality has developed around Kawakubo and her empire. She rarely grants interviews or poses for photographs, which has only contributed to the intrigue. One might think that seeing the clothes in a museum—as objects behind glass—could alienate or distance the viewer from them. But there is no glass in the Met’s open maze, giving it the feel of a space not unlike a runway, in which the viewer might imagine reaching out and touching, even wearing, the otherwise difficult garments. The designs may seem closer to sculpture than clothing, but still they tempt the imagination. Despite how well-suited Kawakubo’s designs are for display in a museum, she has been extremely influential in the larger, mainstream clothing markets. Her interest in structure, and especially her use of architectural form and bold asymmetry, can now be seen on everyday fashions sold by labels like COS, William Okpo and Veda, Chromat, even H&M and J. Crew. One gets the sense, wandering the Met and walking the streets of New York City alike, that Comme des Garçons is one of few labels that have built a viable business while truly challenging industry conventions—begging a tenth Kawakubo “in-between”: Beloved/Radical. 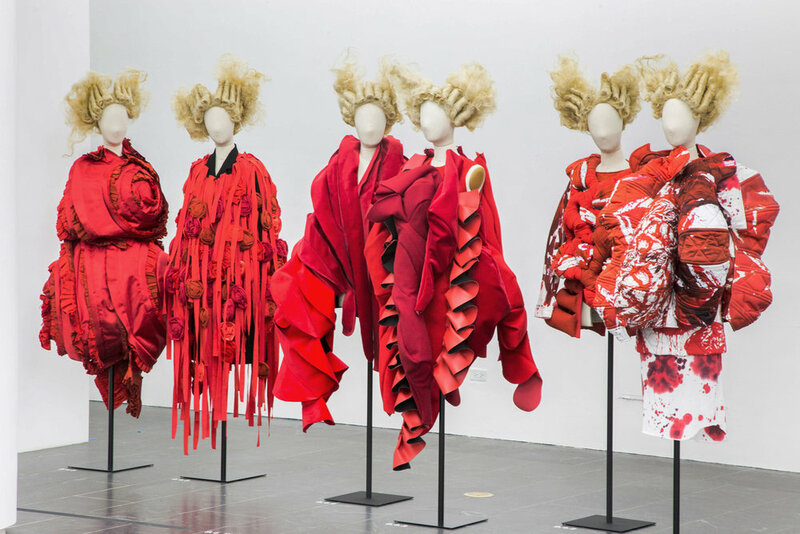 “Rei Kawakubo/Comme des Garçons: Art of the In-Between” is at the Metropolitan Museum of Art through September 4. The catalog, by Andrew Bolton, is published by the Met and distributed by Yale University Press.